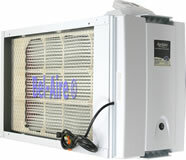 The Aprilaire Model 5000 is a complete system. Included is the event based control, steel frame, the power pack door containing the high voltage power supply, the plastic inner filter housing with ionizer frame and wires, control electrode (prefilter) and 6 pleat spaces (combs). One Aprilaire 501 filter is included. Our photos correctly show the items included. The Aprilaire 5000 does not include an air flow sensor. The air flow sensor would turn on the 5000 only then there is air flow. New furnaces provide a 120v connection to power an air cleaner only when the blower is running (see the schematic pasted on the inside of your blower compartment). The optional Model 51 could otherwise be used. The Aprilaire 5000 is rated #1 by the leading product magazine for 3 years running. The Aprilaire 5000 is now equipped with the new Aprilaire 8476 event based control. Aprilaire 8476 is a programmable thermostat offering temperature and fresh air management in a quality digital control. Universal aplication for both standard and heat pump systems. Easy to program and helps save up to 30% of energy cost. Convenient 5/1/1 day or 5/2 day programming lets you customize your weekday and weekend schedule based on your needs. 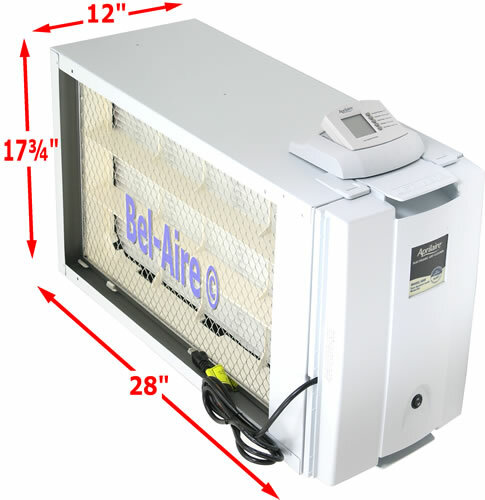 Allows you to clean your air on your terms: When paired with an aprilaire whole-house air purifier, the Event-Based™ Air Cleaning circulates air throughout your home periodically throughout the day or for a specific period of time to provide greater comfort through cleaner air and more even temperatures.